ระบุวันที่และเลือกโรงแรมและที่พักอื่น ๆ จาก 311 แห่ง! 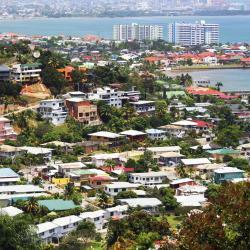 Grand Diamond Trinidad is offering accommodation in Piarco. This 3-star hotel offers free shuttle service, a 24-hour front desk and free WiFi. Really good bed, could have slept longer. The staff is great, very helpful and friendly. Went out of their way to make a really pleasant stay. Made you feel very welcome! Though I left too early to have a proper breakfast, they prepared something for the way. Will definitively stay here again! Hyatt Regency Trinidad is located 5 minutes’ walk from Trinidad and Tobago Water Taxi and Ferry Terminal, plus it offers an outdoor infinity pool, a state-of-the-art gym and a business centre. Stayed only one night but love it. This is Hyatt at its best. We had trouble with ferry to Tobago being cancelled, and concierge arranged everything for us: air tickets, taxi...extremely friendly and helpful. Kariwak Village Hotel is set in Crown Point and has an outdoor swimming pool, a garden and a terrace. This 3-star hotel has air-conditioned rooms with a private bathroom. There is a restaurant. Lovely people, food and gardens. Set in Crown Point, a 15 minutes walk form the beach, The Hummingbird features free WiFi access and free private parking. Some units have a seating area for your convenience. My stay was less than 24hrs, therefore I did not have a chance to enjoy the pool, the restaurant or walk around the property. I must say that Paul is very personable and both Paul and Linda responded to all my emails in a timely manner. Since I was traveling alone, I had many questions regardinging taxis and fares. But, once I arrived everything fell into place and my less than 24hrs stay was great! I would definitely retun to stay here and would recommend it to everyone. It's nice, cozy and comfy! 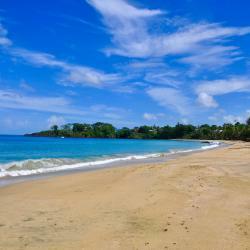 Set in Grafton, Mount Irvine Bay Resort provides a private beach area and free WiFi. Featuring a 24-hour front desk, this property also provides guests with an outdoor pool. The Hotel actually exceeded my expectations as well as the staff, having received less than good service from other hotels in the same area this was a wonderful surprise to have staff willing to assist with questions and are naturally helpful. Great Job Mount Irvin Bay Resort! Located 5 minutes’ walk from Queen’s Park Savannah and from Ellerslie Plaza, Kapok Hotel features a swimming pool, garden and a sun terrace. Free Wi-Fi is available throughout. Friendly staff, clean and comfortable room, decent facilities not to mention great restaurants on both the main and 8th floors. Blue Waters Inn is situated in Speyside, 29 km from Diamond. 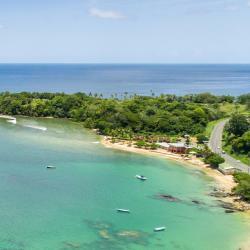 The nearest airport is Tobago Airport, 37 km from the property. Incredible food, chef is unreal. Other reviews mention that dinner is expensive, agree but also worth every penny and the best food we had in Tobago. Staff are excellent - not the management necessarily but the restaurant and bar staff (especially Avion and Erica) Brilliant views Great tours available, go with Franks glass-bottomed boat tours to Little Tobago. 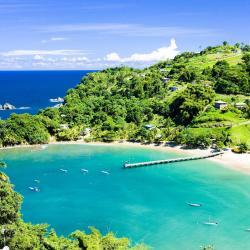 Also, go to Charlotteville and ask for 'Joe' for the best snorkelling tour on the island (pay more than he asks as he only charges for fuel and very little for his time). 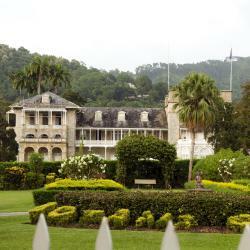 This modern hotel is located in Port of Spain, next to Queen’s Park and the Botanical Gardens. It offers an outdoor pool, tennis courts and a fitness centre, set among 25 acres of gardens. Defenately I’ll be staying here again. Best hotel in Port of Spain. Great views. Great location. Friendly staff. Crown Point Beach Hotel in Crown Point has 3-star accommodation with a casino and an outdoor swimming pool. With a tennis court, the property also features barbecue facilities. Accommodation clean, comfortable, calming. Meals are tasty, especially local dishes. Studio 27 Inn offers air-conditioned rooms in Saint Helena. The accommodation provides a shared kitchen and room service for guests. All rooms in the hotel are fitted with a kettle. Excellent value for price. The staff is very friendly, courteous and helpful. 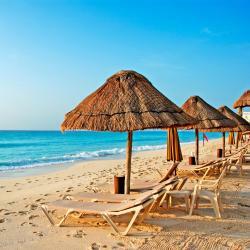 The location is great since it is very close to the airport and the shuttle service is good. Recommend it every time! Keep up the good work! Offering an outdoor pool and a restaurant, Enchanted Waters Tobago is located in Buccoo, 10 minutes’ walk from the beach. Free WiFi access is available in all areas. The service at Enchanted Waters was truly memorable. The Patino's were so welcoming and accommodating. Their pleasant smiles and 'can do' attitudes only made me wish for a longer stay. 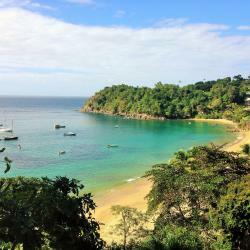 This eco-friendly hotel is set in Grande Riviere Bay between the river, the beach and the mountains. great cocoa tea. as good as on my cocoa estate in Gran Couva. totally local. 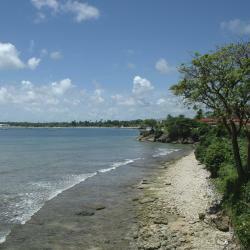 Set in Crown Point, Tropikist Beach Hotel and Resort offers 3-star accommodation with a garden. With a terrace, the property also has a shared lounge. The food was extravagant. Everything about this hotel is perfect for any type of vacation. Offering an outdoor pool and a restaurant, Radisson Hotel Trinidad is located in Port-of-Spain, overlooking the Gulf of Paria. It features free WiFi and a fitness centre. Super clean room and super comfortable bed. Friendly receptionists and bar people. Mr. Wayne FB even helped me with my local phone number top up the data credit. Amazing! Thanks very much and I will come back for sure! Offering an extensive garden, a lounge area with a flat-screen TV, free Wi-Fi and a sun terrace with a swimming pool, Holiday Inn Express Trincity is 3 km from Piarco International Airport. Super friendly staff, always willing to help and very polite. Breakfast is good and even though they don't have a restaurant (for lunch and dinner), you can get delivery for a couple fo places nearby. The staff is very helpful with that. They also have a shuttle which is an excellent idea and the easiest way to go to the mall and to the airport. 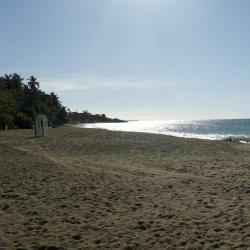 Offering a private beach area, hot tub and 3 swimming pools with sun terrace, Magdalena Grand Beach & Golf Resort is set on the shores of Little Rockly Bay and 10 minutes’ drive from Scarborough City.... Very convenient for a short, weekend stay. The staff, were without exception helpful and friendly. 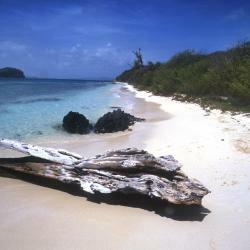 This is slightly unusual for Tobago in my 20 year experience. A special mention goes to the general manager, Vinod and his Food and Beverage Manager Troy.